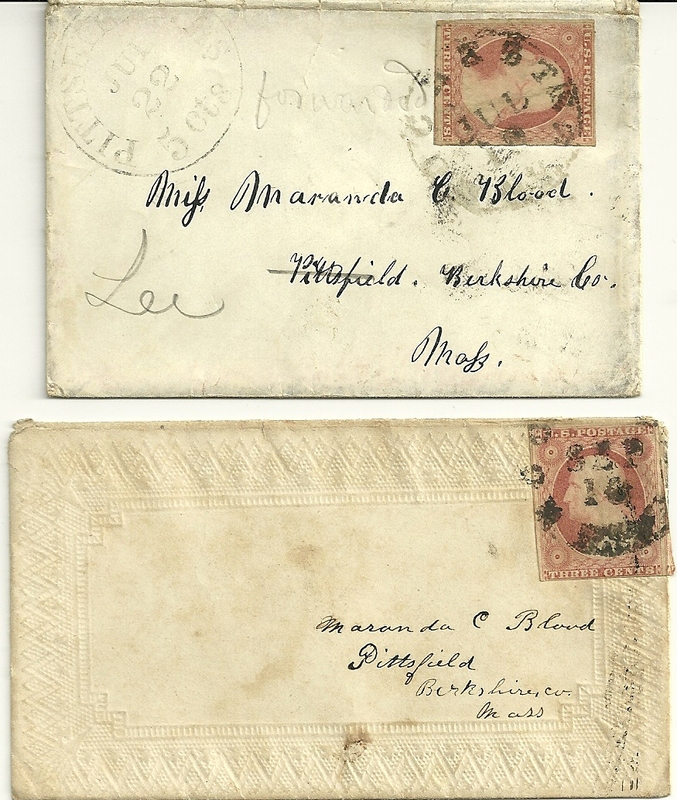 Undated letter from Elsie E. Leonard to Maranda C. Blood of Lee, Massachusetts. There are two envelopes, but sadly only one letter, which was enclosed in the larger of the two envelopes. 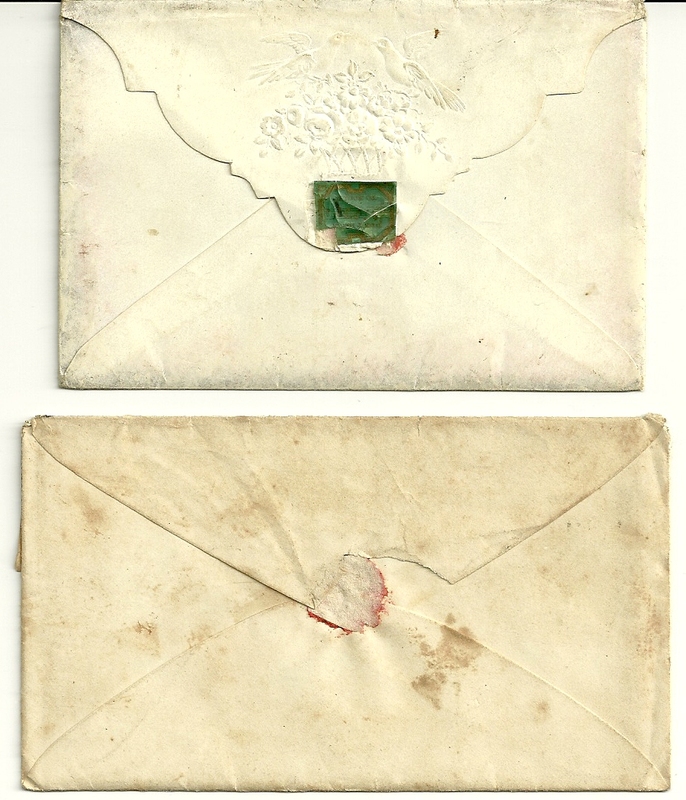 I'm hoping that a philatelist or postal history buff might be able to glean a date range from the postal markings. Elsie sent Maranda a two-page letter full of news and names that might give enough information for a Massachusetts researcher to be able to identify one or both of them. I have received your second letter and read the contents with much pleasure. I am very glad you arrived there safe and found all well, and enjoy yourself so much visiting among your relatives and friends - for I would like to do so too but that privilege is in a measure denied me and I can submit to my fate very easily. 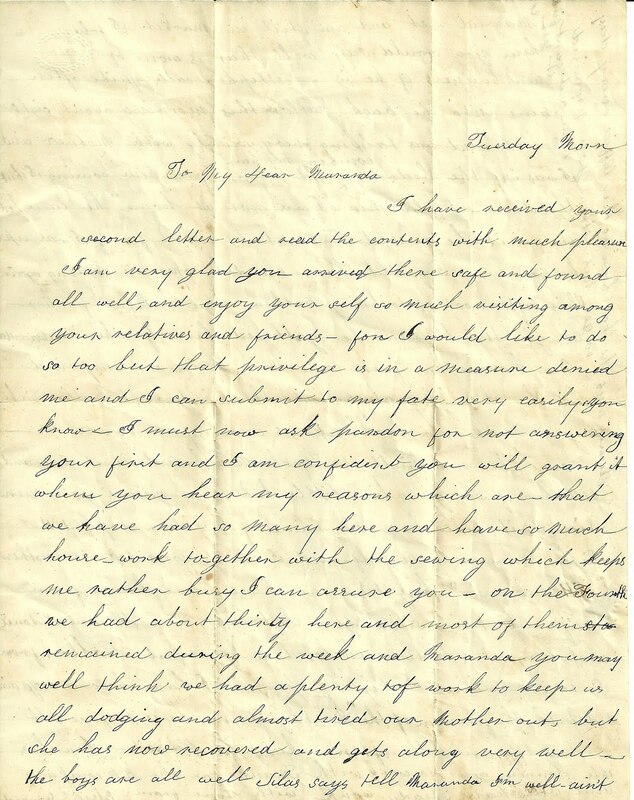 You know I must now ask pardon for not answering your first and I am confident you will grant it when you hear my reasons which are that we have had so many here and have so much house-work to-gether with all the sewing which keeps me rather busy I can assure you. On the Fourth we had about thirty here and most of them remained during the week and Maranda you may well think we had a plenty of work to keep us all dodging and almost tired our Mother out, but she has now recovered and gets along very well. The boys are all well. Silas says tell Maranda I'm well - ain't married yet and am still in market. I told him you would say well that is none of my business if he is. Stephen calls quite often, came into the back parlor this morning about eight o'clock and was talking very sociably with Mother and I was in the bedroom combing my hair and when I saw him coming I shut the door. I told him I was not "at home". He laughed and said he guessed I must be abed for if I was up he was sure I would have the door open. Is coming again this afternoon to bring Mother some balsam for her cough. The balsams he gathered himself when in Canada. Mr. Morrison [?] has just come down again and surprised me by throwing chips into the window at Mother as he says to make her look up - is coming in to see us. Remember me kindly to Uncle Clark and Aunt Ann and tell her if she gives her little babe those names you mentioned - it will have the name of my dear departed sister Mary and myself and I shall consider it another "Little Cousin". Kiss it for me. We have heard from California twice since you left, one from Hiram Sidonie and Augustus. In it was enclosed a beautiful collar from Sis to me which I highly prize. I have become acquainted with the fireman of the "North Star". He is a fine young man, calls often, has just passed. 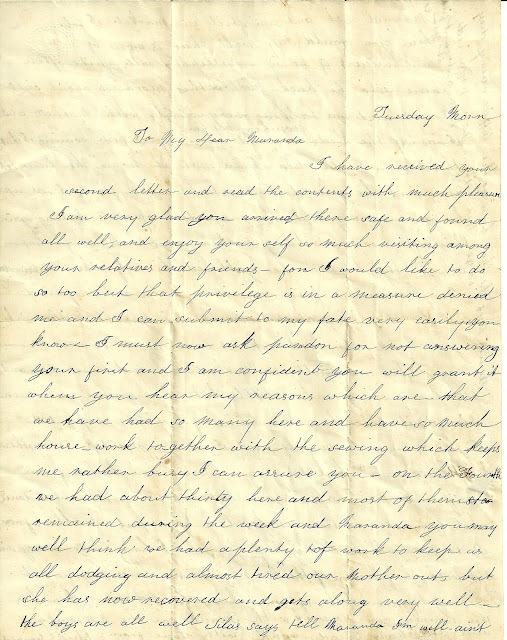 Ina has this morning gone to work with Frank for the RR company and will have steady work. With love from Elsie E. Leonard. [Off to the side of the letter is this: James says he has been to the Office every day to get his letter you promised him but can't find it yet. I'm looking for Maranda C. Blood and Elsie E. Leonard, but it's tough going. I found references online to a court case in California involving a Hiram and Sidonie Leonard; perhaps Hiram was Elsie's brother, and Sidonie was "Sis", her sister-in-law. And perhaps Silas was Silas Leonard, her brother. Whether Augustus is also a Leonard, or not, I'm not sure. Ina may be another sister, perhaps Ina Leonard. It sounds as though the Leonard family may have operated a hotel or boarding house. Or that they opened their home for the Fourth of July to up to thirty relatives and friends. The Berkshires were, and still are, a place for city folk to escape the heat. 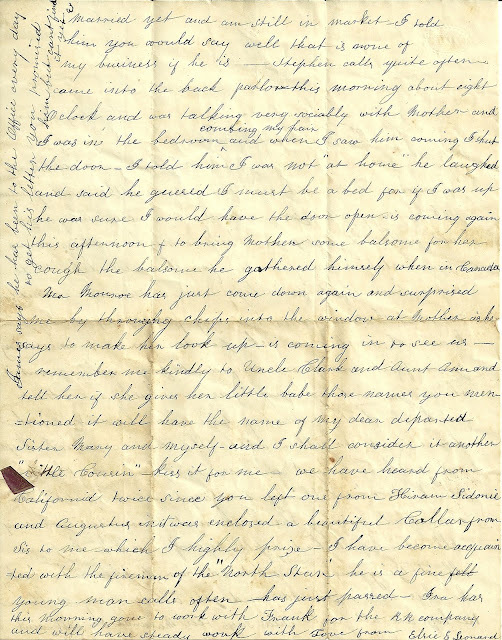 "Uncle Clark and Aunt Ann" may be Henry Clark Blood and wife Ann Elizabeth (Merry) Clark of Pittsfield, Massachusetts. Online references to their children don't include a Maranda; she may or may not have been related to them. I'd love to know more about the fireman of the "North Star" - perhaps he and Elsie became a couple? If you have any insights into any of the people mentioned in the letter, or its date range, please leave a comment or contact me directly. Thanks! The person who runs this website, http://philgen.org/, may help out with the date of the stamp, etc. I've picked a few envelopes off his site for blog topics already. He had an article or two in either the NEHG Register or American Ancestors about his project also.